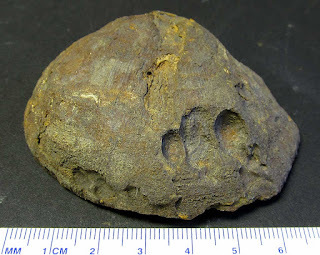 This image shows an Orthotetes keokuk brachiopod fossil with some type of boring holes. Maybe they were made by some sort of predator? Thanks Kenny for the picture. 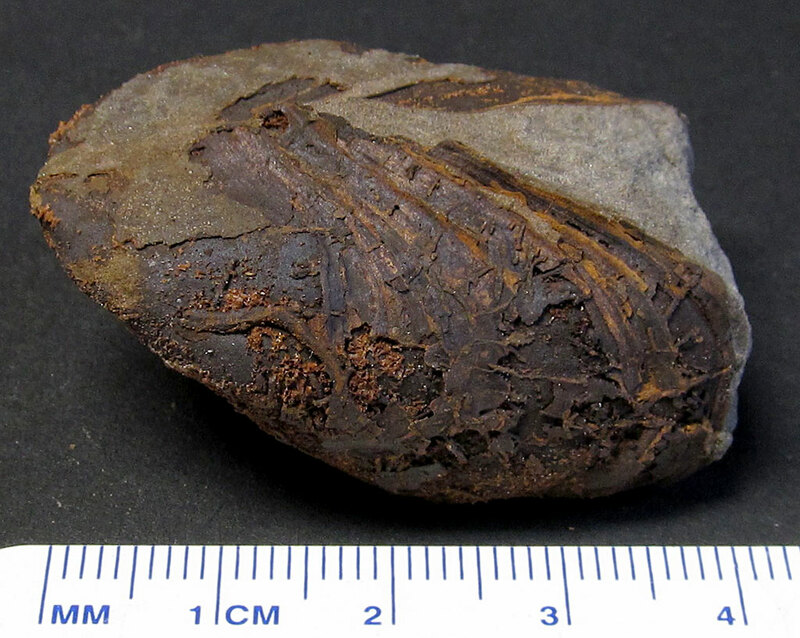 This image shows inside of the shell of an Orthotetes keokuk brachiopod fossil. Thanks Kenny for the image. 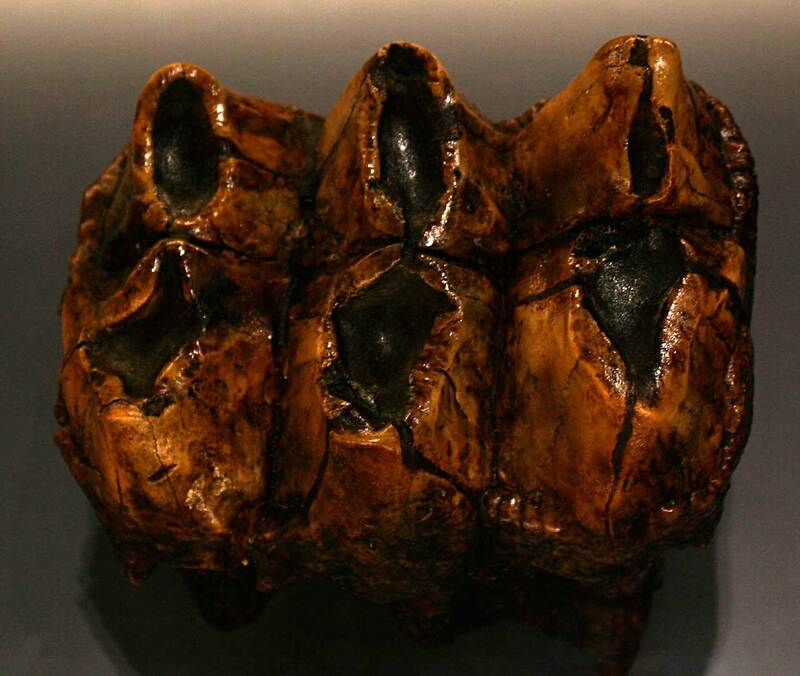 This mastodon tooth is on display at the Falls of the Ohio State Park Interpretive Center. A learned a couple of things from the display. Mastodons differ from mammoths in their teeth were used to eat more trees (branches, twigs, bark) while the mammoths ate more grasses. Also mammoths are more similar to today's elephants with their longer tusks and more distinct heads. The mastodon has a flatter head, longer body and short tusks. A French-Canadian explorer Charles Le Moyne found the first American mastodon skeleton in 1739 in what would be come Kentucky. 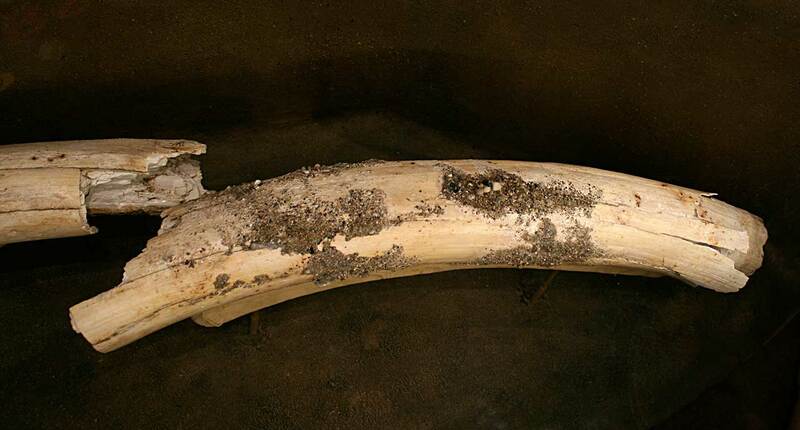 The bones were sent to Georges Cuvier in Paris France who named it Mastodon americanus. 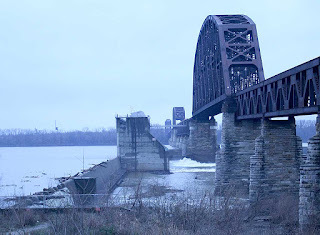 Learn more by visiting the Falls of the Ohio State Park in Clark County, Indiana, USA. 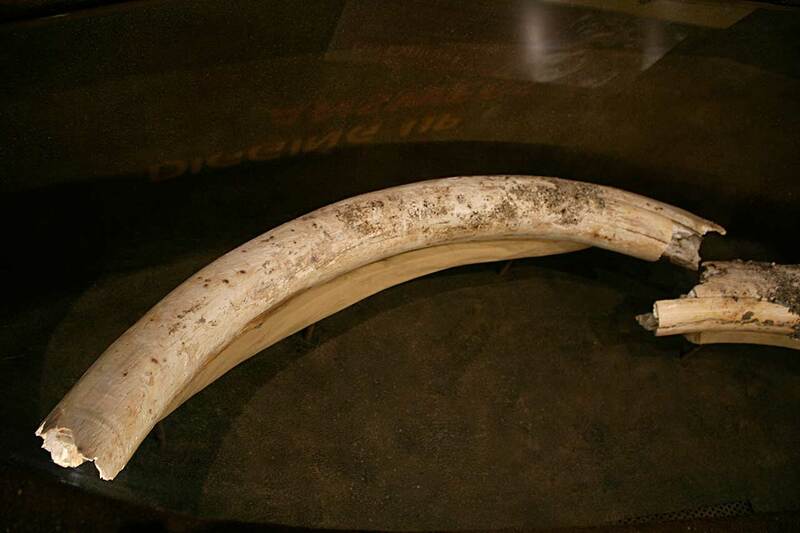 These mammoth tusk pieces are on display at the Falls of the Ohio State Park Interpretive Center. 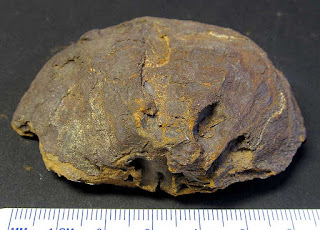 They thought to be 12,000 to 20,000 years old. The tusks were unearthed at the Nugent Sand Company quarry in Bethlehem, Indiana, USA. Studying the dentine layers on these tusks can help researchers determine the age of the creature when it died. I have not seen Indiana tusks in this good of condition before. If you get chance, try to visit as they have quite a few fossils and artifacts on display. This fossil is on display at the Falls of the Ohio State Park Interpretive Center. It is thought to be an Aulocystis (?) procumbens tube coral growing on top of a Favosites turbinatus tabulate coral fossil. They existed in the Devonian time period and were found in the Jeffersonville Limestone of Clark County, Indiana, USA. Very neat specimen put on display in the new exhibit there. 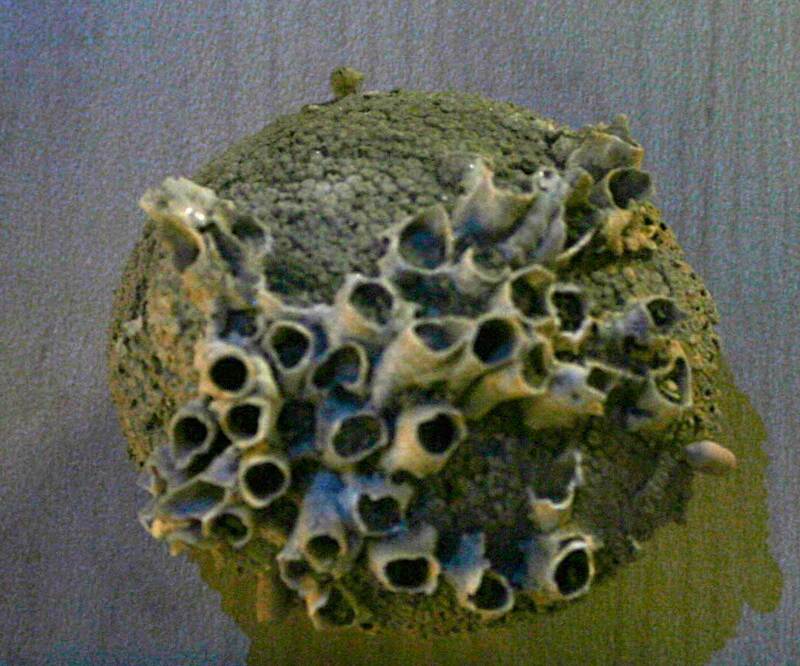 If you get chance, try to visit as they have quite a few fossils on display. 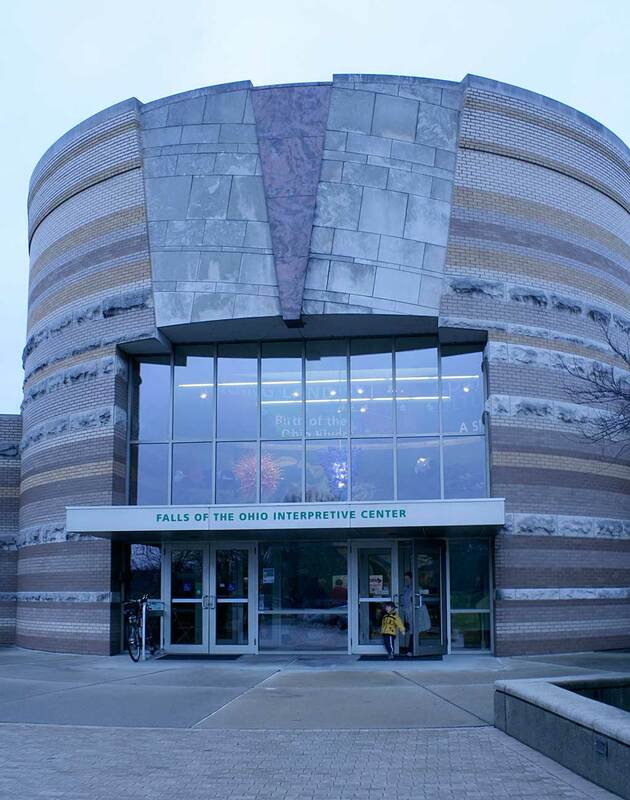 January 8, 2016 the new exhibits at Falls of the Ohio State Park Interpretive Center were dedicated and opened up the general public. A large crowd turned out for the center becoming available for visitors to see. One now makes a loop through the exhibits starting with an introductory movie in the theater and then exiting to the geological and paleontology exhibit explaining the Devonian reef and the fossil left that can be observed. 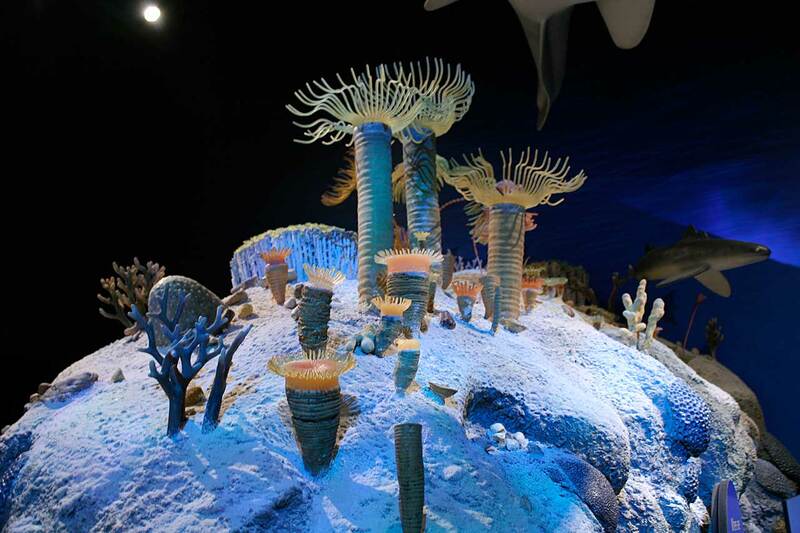 In interactive reef is available for people to touch and study. 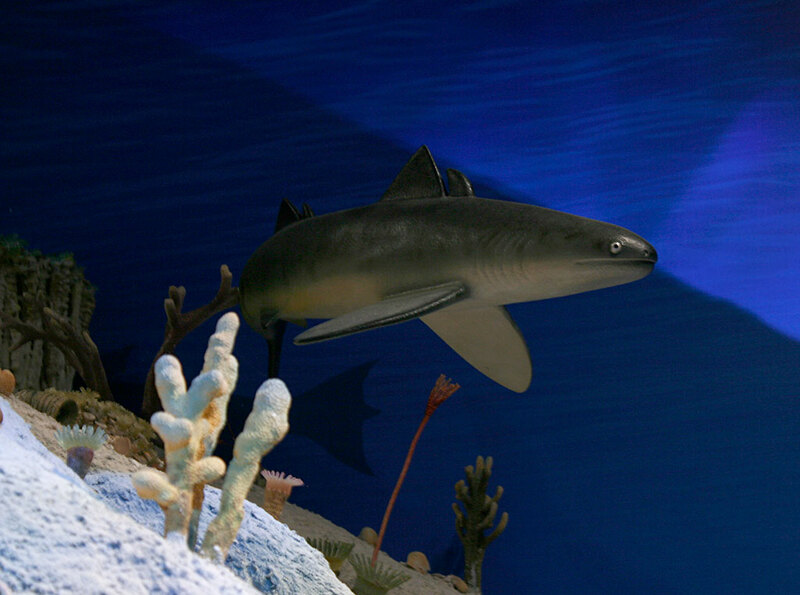 One room has a projection of an animated graphic of the reef with sharks and arthrodires swimming in the back ground while horn corals filter the water for food. 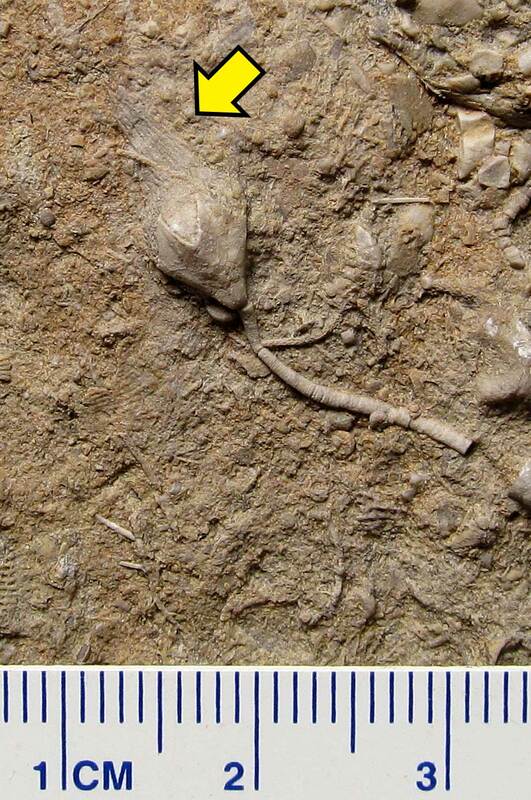 Trilobites and gastropods can be see moving along the seafloor as well. Ocean sound effects give one the feeling of a watery environment. 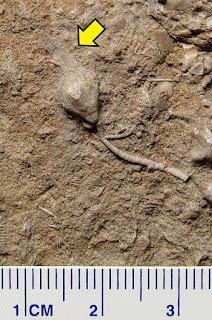 A number of fossils found at the Falls are on display as well. Visitors then move on to how the river was formed and information about glaciers role in the area's past. The next room shows paleontology with samples of Mastodon and Mammoth fossils. 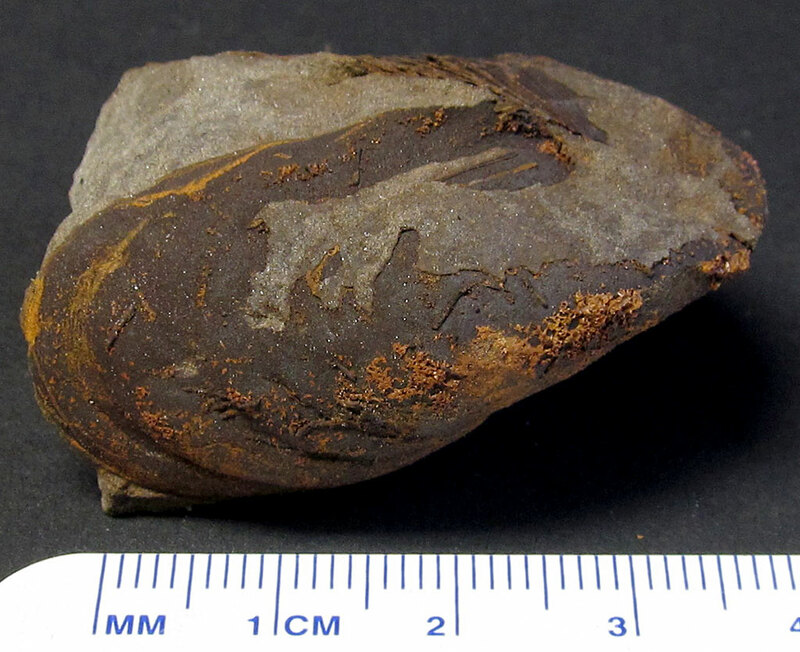 It also display native American stone tools and information about their settlements at the Falls. Moving through a corridor leads to information about European settlers and then a short video about the Lewis and Clark expedition. Last, a showcase of animals that live around the Falls and an information exhibit about water use and pollution affecting the Ohio River. Guided fossil bed hike and special tour of the Ancient Sea in the exhibit gallery. Cake to be served. Clean up trash along the riverbank. Geared for serious amateur paleontologists, educators and students, it features guest speakers on Saturday and an off-site collecting trip on Sunday. $15 per person registration fee. Maximum of 30 participants. 21st year for this event. Lots of hands on activities around the parking lot with collecting in the fossil/mineral piles, atlatl throwing, mock dig, displays and hikes around the fossil beds. $2 per person admission. Wow, the great finds of 2016 keep coming. 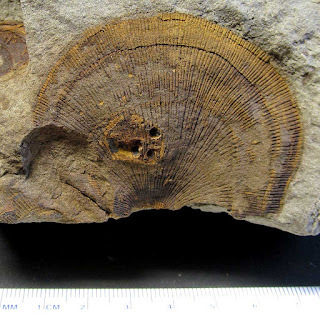 Here is rare fossil find in that it is an intact Myalina clam fossil. One can still see some of the growth layers on the shell. Usually one only comes across one side of the shell. 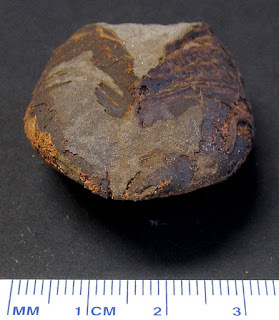 It was found in the Edwardsville Formation of Floyd County, Indiana, USA. The fossil dates to the lower Carboniferous (Mississippian) Period. 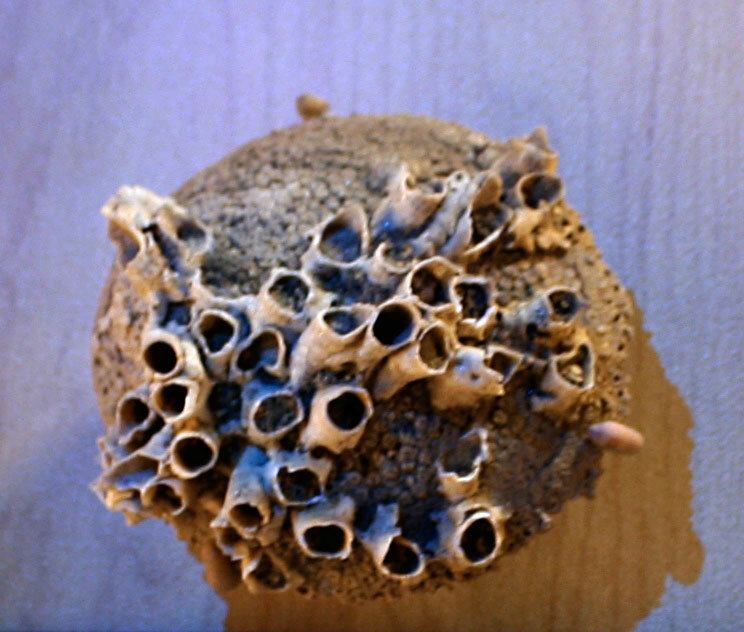 This next picture of one side of the shell is interesting in that it might the remains of a coral or bryozoan that attached to the exterior. Thanks to Kenny for these images. 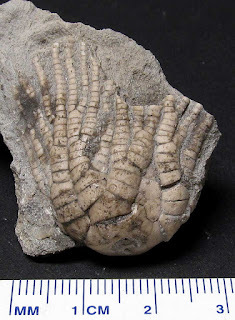 This image shows a nice crinoid calyx fossil called Zeacrinites wortheni. It was found in the Indiana Springs Member of Crawford County, Indiana, USA. 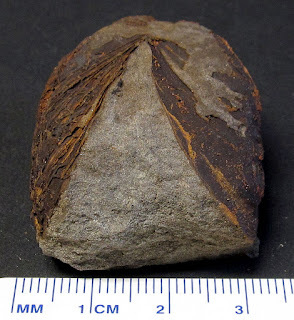 The fossil dates to the lower Carboniferous Period (Mississippian). 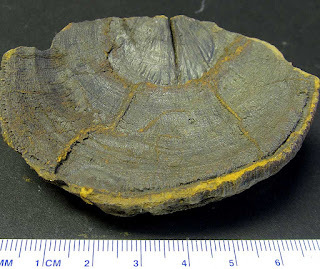 Zeacrinites was named by a Dutch-American scientist Gerard Troost in the 1800s, he derived the name from Zea (maize or corn) and the Greek kronon (lily) after his assistant said the fossil resembled 'a petrified corn cob'. 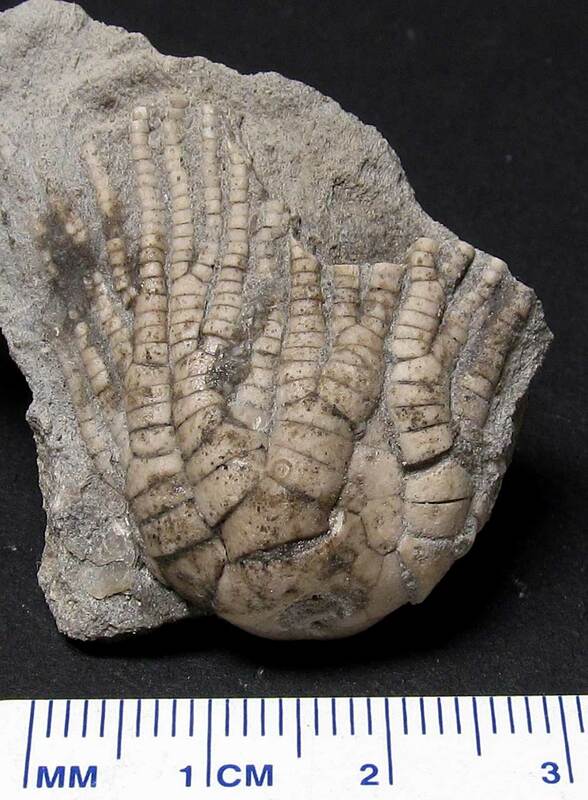 This account is reiterated in the 1909 Smithsonian Institution United States National Museum Bulletin 64 A Critical Summary of Troost's Unpublished Manuscript on the Crinoids of Tennessee by Elvira Woods of Columbia University, New York City on page 89. 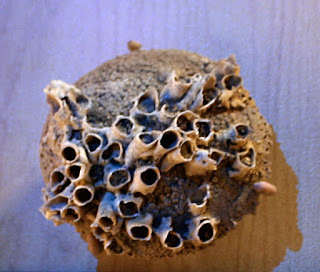 "in fact it resembles as much a corn cob, as an Apriocrinus resembles a pear or a Rhodocrinus a rose... I gave it only a scientific appearance, to which I have joined the name of another plant which adorns our western forests by the beauty of its flowers and delicacy of its perfume namely the magnolia, by which I was surrounded when I found it." Thanks for the image Kenny. and part of its very thin feeding tube brachioles intact (see arrow in picture). 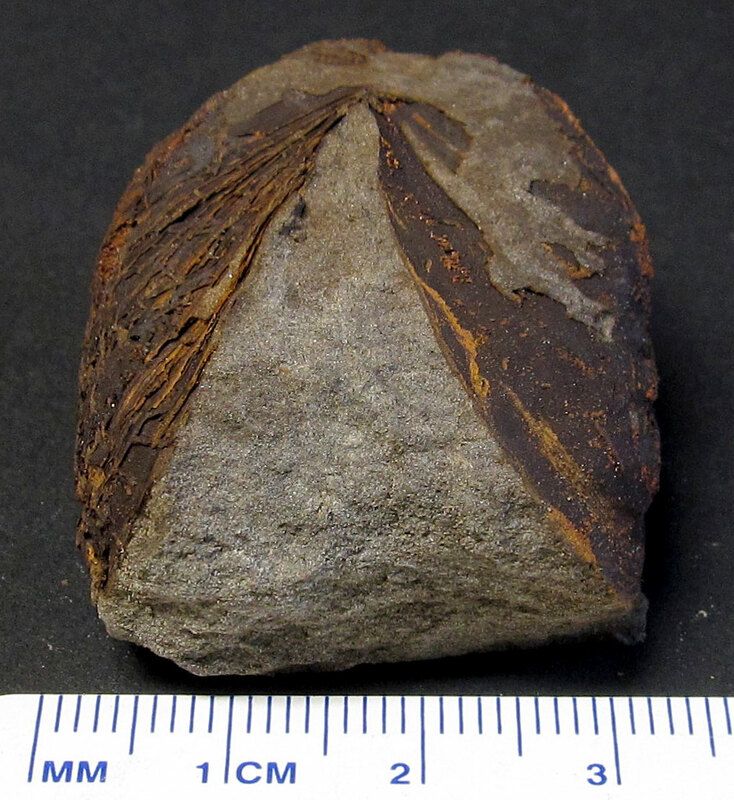 Blastoid is a species of the genus Pentremites. 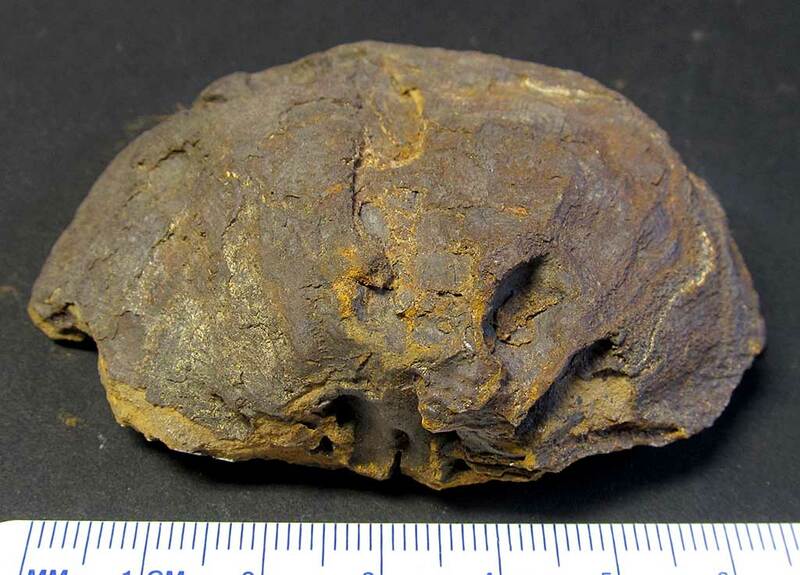 It was found in the Indiana Springs Member of Crawford County, Indiana, USA. 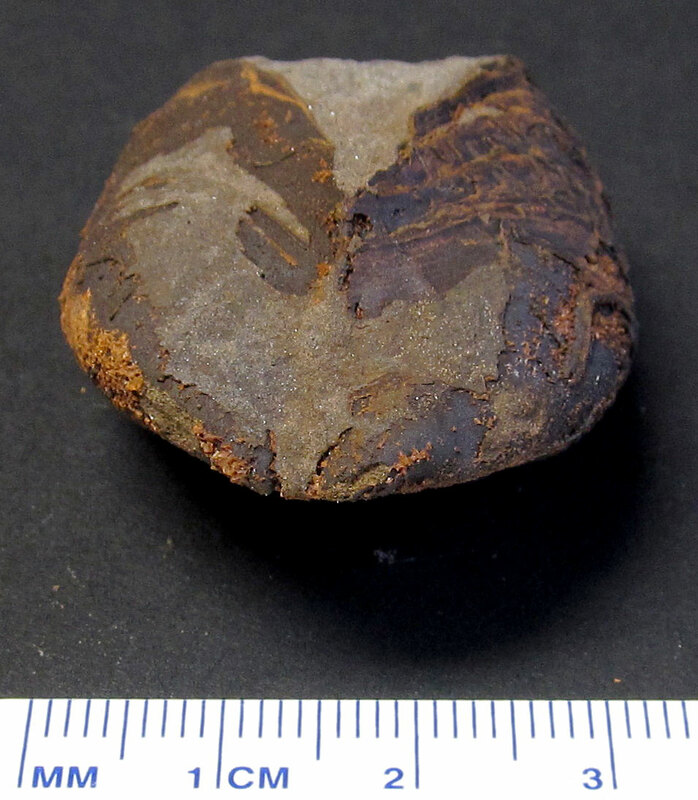 The fossil dates to the lower Carboniferous Period (Mississippian).